Rock n’ Roll Christmas music is undoubtedly the biggest “sub-category” in my collection; it spans every music media format except 8-track and reel-to-reel. This year marks the assembly of my 10th Compilation Christmas cd — and there’s plenty more where that came from, I assure you. My interest in yule tunes began 33 years ago when I was Christmas shopping at the Richmond Mall with my mom. As always, I had accompanied her for as long as my patience could stand before suggesting thirty minutes of solo shopping and meeting up by the movie theaters. This was simply a selfish excuse to dive-bomb the record racks in JC Penny, Woolworths, Sears, and my favorite, Record Rendezvous. Thirty minutes was just about enough time to make the four-store circuit if I didn’t dawdle and didn’t stop to gawk under the black lights in Spencer Gifts. 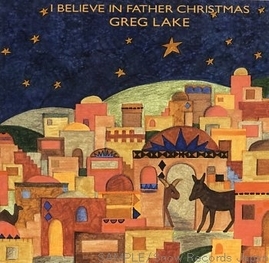 ﻿I was transfixed by the song itself because I think it was my first encounter with non-traditional or non-religious Christmas music. In retrospect I also realize that part of my fascination was probably due to the fact that this was the first “music video” I had ever seen — six years before MTV broadcast The Buggles and “music video” became a common household term. The song itself also has everything. A soft-spoken rant against the gross commercialization of Christmas. Sleigh bells and choirs. And, of course, the musical refrain from Prokofiev’s Lieutenant Kije Suite which, for me, evokes snow and Christmas and winter and sleigh rides like no other piece of music. As rain gently falls on Kensington tonight there’s no snow for Santa’s sled. However, after all these years, there is still a hint of “magic” in the air and the promise of surprise that always brings joy and laughter. I embrace that sense of wonder and welcome a Christmas day full of love and cheer and child-like excitement — punctuated by music of the season.